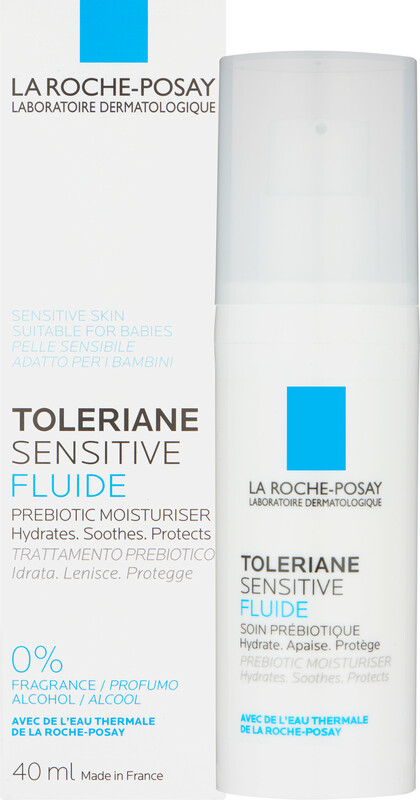 Instantly hydrate and soothe irritated, sensitive skin with the La Roche-Posay Toleraine Sensitive Fluide, a lightweight moisturising fluid that will help to restore calm. The Toleriane Sensitive Fluide has a wonderfully soothing light and non-oily texture that feels fresh on application, making it suitable for combination to oily skin types that are prone to intolerances. It provides an instant surge of moisture, which penetrates quickly into the skin to restore comfort. This soothing moisturiser has been created with a minimum number of ingredients to reduce the risk of sensitivity. Its calming formula is enriched with skin-rejuvenating and antioxidant-rich La Roche-Posay thermal spring water, which assists in reducing symptoms of aggravation and irritation. Toleriane Sensitive Fluid has also been dermatologically tested to ensure its suitability for use on even the most sensitive of skin. Gentle and trusted, this moisturising solution is part of a range of skincare products by La Roche-Posay to be given the first Allergy UK seal of approval. If you love simple, uncomplicated skincare but don’t want to compromise on effectiveness, the La Roche-Posay Toleriene line-up is for you. This lightweight moisturiser from the range is perfect for those who want a product to soothe reactive skin in need of some comfort and makes a great base for makeup with its shine-free finish. After cleansing, apply to the face and neck both morning and evening. This lightweight moisturiser is part of the La Roche Posay Toleriane range, a collection of products specifically tailored towards the needs of sensitised skin. La Roche-Posay Toleriane Sensitive Fluide 40ml is rated 4.6 out of 5 by 15. Rated 3 out of 5 by millymollymandy from Does what it says on the tin Very light, fragrance free, ok for all over face including T-zone as it's so thin. Does not irritate my rosacea - (unlike some of the Roche-Posay 'Rosaliac' products which although aimed at rosacea sufferers don't work for me at all). Rated 5 out of 5 by jojo27 from brilliant brilliant moisturiser! I have oily, acne prone skin, and this works really well before makeup, keeps my skin soft but not too shiny! Rated 5 out of 5 by Ann58 from Toleraine 3 people in my family use these products now! They are really very good. I would recommend to anyone with problematic skin. Fab u lous!